Flint, Mich. – Six current Firebirds represented Flint in National Hockey League (NHL) Development Camps last week. 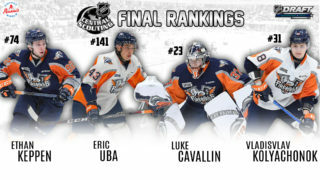 Firebirds’ Dennis Busby (Arizona Coyotes), Ty Dellandrea (Dallas Stars), Fedor Gordeev (Toronto Maple Leafs), Riley McCourt (Dallas Stars), Hakon Nilsen (New York Islanders) and Connor Roberts (Pittsburgh Penguins) all recently competed in NHL camps. 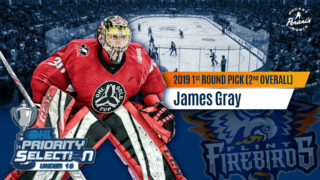 Both Busby and Dellandrea made history June 22-23 as the two were the first players that were originally drafted by the Flint Firebirds and were then drafted into the National Hockey League. Dellandrea was selected in the first round (13th overall) by the Dallas Stars and Dennis Busby was tabbed in the fifth round (145th overall) by the Arizona Coyotes. 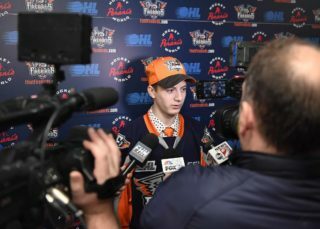 Gordeev was selected out of the Firebirds’ organization by the Toronto Maple Leafs in the fifth-round (141st overall) in last year’s 2017 NHL Entry Draft. He finished second among Firebirds’ defenseman with 25 points (8G, 17A) in 67 games played during the 2017-18 season. McCourt attended the Dallas Stars Development Camp as a free agent invite. He finished second among returning Firebirds’ defenseman with 22 points (5G, 17A) in 56 games played. McCourt had two power-play goals, six power-play assists and one game-winning goal last season. Nilsen was a free agent invite to the New York Islanders Development Camp last week. One of only two remaining Firebirds to play in Flint all three seasons, Nilsen recorded eight assists, two of which were on the power-play and had 57 shots on net during the 2017-18 campaign. Roberts skated in the Pittsburgh Penguins Development Camp also as a free agent invite. Roberts finished second among all returning Firebirds last season, posting 35 points (18G, 17A) in 66 games played. He had five power-play goals and 131 shots on goal. The prospect camps give NHL clubs the opportunity to evaluate some of the game’s top prospects from the junior and professional levels. Players take part in daily intrasquad contests along with sessions on player development and on-ice workouts among many other things. Both drafted players and free-agent prospects along with invitees can participate in these camps, providing the NHL teams a chance to survey player skills, abilities and growth. Each NHL team runs its own development camp during the summer months, which includes their drafted prospects as well as a handful of players who are invited as guests.